The major cryptocurrency dove to $5,390.12 marking a new low on the year. Ethereum and XRP, the 2nd and 3rd largest cryptocurrencies fell 13% and 15% respectively. Bitcoin’s last several months of relative stability came to a halt Wednesday. 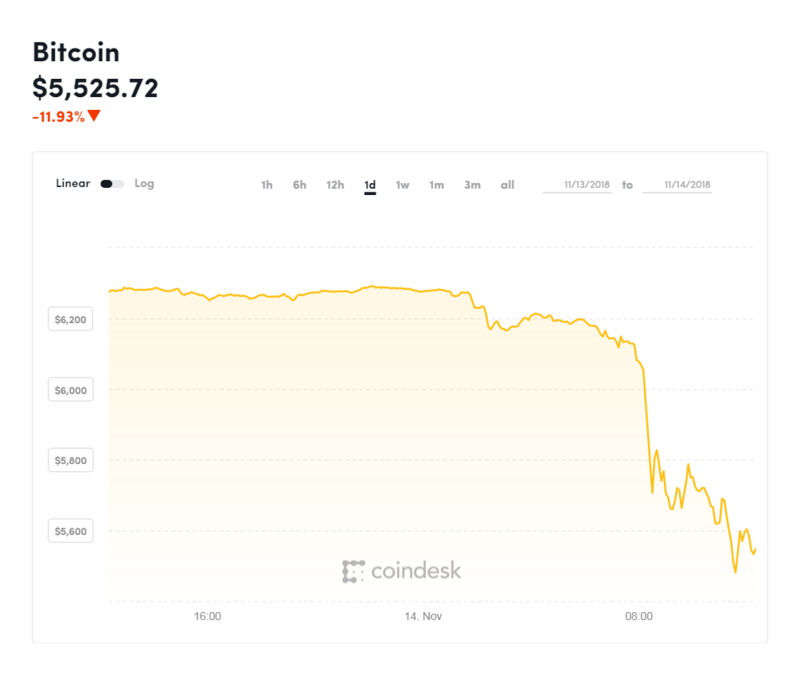 Bitcoin fell 9% to a low of 5,390.12, it had been trading around the 6,400 mark for several weeks in contrast from the rest of its trading since January. Ether fell as much as 13%, while XRP, the 3rd largest cryptocurrency by market capitalization, dropped 15%, according to the trading data recieved from CoinMarketCap.com. The deep dive may be being spurred by uncertainty around Bitcoin cash, according to market analysts. Bitcoin Cash itself is a result of a fork from Bitcoin, after an internal disagreement on the best way to scale the #1 digital currency. The entire cryptocurrency market capitalization dropped by $15-B Wednesday. The total market cap was around $185-B, down more than 70% since mid-December 2017. Bitcoin broke a Key support mark at 6,000 triggering a technical sell off in the #1 digital currency and other crypto assets in what has been a prolonged market slump YTD. Bitcoin fell to as low as 5,533.09 on the Bitstamp platform. It is currently down 11.86% at 5,586.97. The break of 6,200 Tuesday gave a us an indication that there are no buyers on the sidelines at this point or strong bids under the market in here. As Bitcoin drops below 6,000 it any stop loss orders then automatically go into the market, investors and traders back away or fade.